From time-to-time, people wonder what NCP is doing on our client list. The truth is that we love them. And this week that was especially true as we managed to help the nation’s largest car park operator make its way onto Channel 4’s The Last Leg with a spot of reactive creative thinking. See, Sarah Storey (as we are sure you will know), became the country’s most decorated athlete last week. And we happened to notice that The Last Leg was asking people to come up with cunning ways of celebrating this achievement. 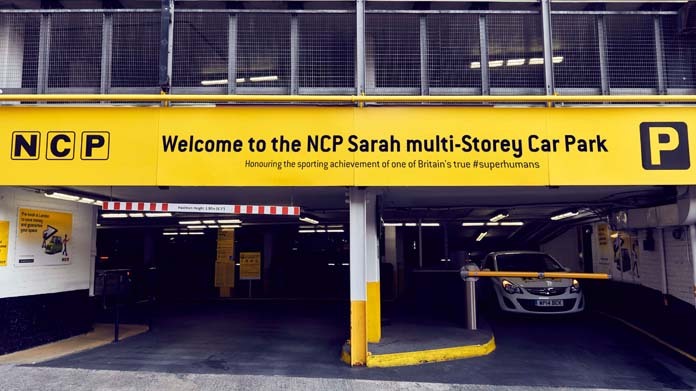 What better way, we thought, than with a Sarah multi-Storey Car Park (see what we did there)? A quick spot of sign making and photography later, we had our tall tale (sorry) ready to go. And, lo-and-behold, it had the desired effect as NCP scored not one but two appearances on the Channel 4 Paralympics round-up show, applauded by the hosts, audience and social media for its quick thinking. Albeit here and there in the show’s trademark style. Watch it here (fast forward to 10.22 to see our slot).